Photobooth is the latest trend for weddings and other events being offered to your guest for that candid, wacky, and not so formal shot. The guest will pose for the camera four times to capture that candid fun shots in a postcard print out. Photobooths will be an instant hit for all ages and will have people talking about your event for years to come. It is perfect for weddings, birthdays, graduations, prom, reunions, corporate and charity events to name a few. Make sure that your guest will take the full advantage of the ultimate party photobooth experience for your wedding guest or other events. It’s important that you place your well lit photo booth in a very visible spot of your weddng reception or any event party celebration venue preferrably next to a bar or where the action is taking place. After getting that wacky shot and exiting the photobooth, they want to see and enjoy prints instantly placed next to the guestbook so they could sign as well. The more the merrier. Get a photobooth that is designed for large group where they can have fun together while they pile into the booth. It makes a difference compared to a small one that can fit only 2-3 persons. Tell your guest that you’ll be having a photobooth on your event which will be available at no cost. Remind them again through your host or MC about the photobooth’s location throughout the night. It’s a must for weddings, corporate events, holiday parties, graduations, and other events because it is entertaining and fun. You can either use a mustaches on a stick, clown noses, angel wings, a sword, eye patch, and much more. 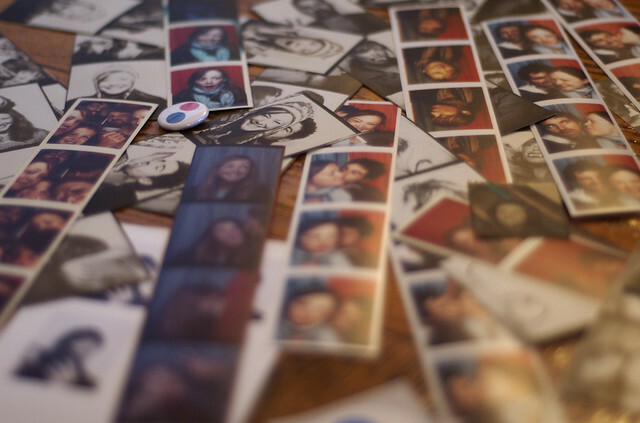 The photobooth postcard prints itself makes a perfect souvenir of your event that your guest will cherish. But if you want to add more to that, you can give away mugs, bag tags, bookmarks, and alot more with their wacky photobooth images printed on it – instantly. Have a slideshow of the photos taken from the photobooth using an external large monitor for your guest to view those hilarious and fun moments. It will catch the fancy of the crowd and will notice those different ackward poses by their friends, relatives, and co-workers. Not all photobooth rentals offer a range of print formats. But it’s better to have a wide variety of print formats to choose from. Whether you like a one (1) photo only print format or four (4) photo print format laid out in one postcard photo print together with customized graphic design, text and logo on prints. Here are some of the photobooth images and graphic designs applied to it for some creative ideas from Polite In Public Photobooth, a sophisticated marketing solution connecting brands to consumers. It is based in Los Angeles and carries the slogan “Nevermind Your Manners. Be Polite Today.” Check out their website at PoliteInPublic.com to know more. Make your event truly memorable. Have your guest take home a memory of your wedding or party event to be cherished forever. Jazz up your event with an ultimate photobooth experience.